Deluxe edition, 1997. Scale 1: 5,000,000, dimensions 74"x 43" (188 x 109 cm), 1 sheet, in Cyrillic. Printed in the USA in one piece on 100 lb. premium gloss cover stock with protective waterproof UV varnish. More than 5,000 cities and settlements; about 8,000 geographical names; major railways and highways; borders of the states and subjects of Russian Federation; rivers and lakes; natural zones, etc. The Index of the geographic names in English and Russian comes in a separate brochure. This edition is sold out. You might consider ordering a folded version of this map. 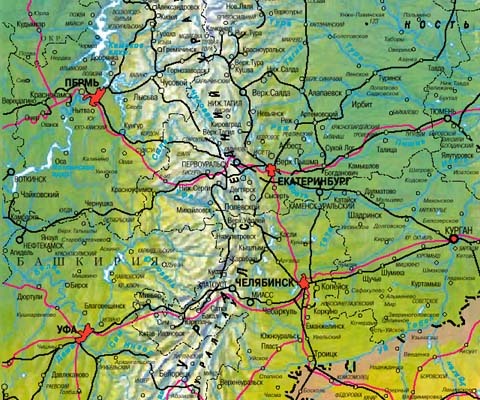 NEWS: We recently received a very limited quantity of 4th edition Wall map of Russia (2005) in Cyrillic. Scale 1:4,500,000, dimensions 77.5"x 49" (197 x 124 cm), 1 sheet, printed in Germany on 230 g/m2 cover stock. Price for a single copy, including a separate brochure "Index of Geographic Names", is $140.00 plus S&H.